SPECIFICATION: 5 berth, single axle, body length guide 19ft. WEIGHT: Plated MIRO 1361kg. MTPLM 1525kg. LAYOUT: front straight seats, mid kitchen, washroom, end singles with bunk. 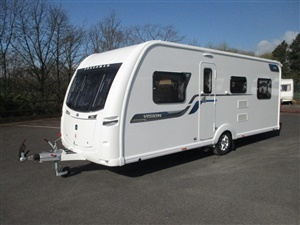 FEATURES: double glazed, blownair, TRUMA Heating System, mains electric, charger, TRUMA gas and electric hot water system, shower, cassette toilet, fridge, oven, hob, grill, microwave, flyscreens and blinds, door flyscreen, large rooflight, sprung seatys, TV aerial, hitch stabilizer, spare wheel, fitted motormover.